The Pantone color of the year for 2016 is a blend of two refreshing and subtle colors; a huge contrast to last year’s Marsala. This is the first time they used two colors instead of one. Here are just a few of the words Pantone uses to describe the feeling Serenity and Rose Quartz psychologically portray. When Pantone releases their color of the year they are setting the tone for upcoming trends. They pull influences from fashion, automotive design, interior design, technology and trade shows. They analyze how color impacts mood and how it relates to current events. Colors are important within the promotional products industry as well. Logos and corporate identities use specific PMS colors to represent their brand. PMS stands for the Pantone Matching System. This system is how were are able to make sure that corporate colors remain consistent and that they match when printed on promo items. Read The Importance of Color and the Pantone Color of the Year to learn more. Will your brand dictate a trend? Will you follow this trend or create a new one? 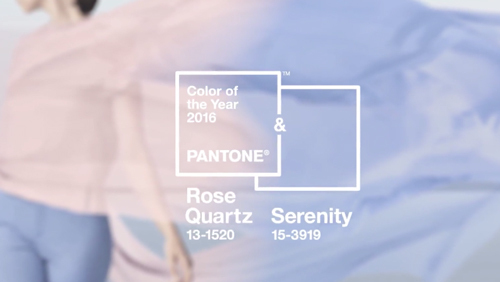 How do you feel about Pantone’s color of the year choices? Will you use these colors in your own brand or design? This entry was posted in Brand Awareness and tagged pantone matching system, PMS, promo items, trade shows, trends. Bookmark the permalink. Hi Susan- I am not impressed with the color of the year either. But with a time of chaos I guess it is suppose to be soothing. I like the serenity color more than rose quartz. Rose quartz isn’t my favorite sorry to say. I think we are all in need of some balance, calming, wellness, compatible, duality, and tranquility this year. Here’s to hoping that they are right and we have a less stressful year. Happy new year. Arlene, I guess so far I’m odd man out. While I’m not impressed by the Rose Quarts colour, I do really like Serenity and to me that colour is calming and soothing. I’ve never heard of the Pantone Color Institute – interesting that. Does knowing the colour of the year serve a purpose? Lenie- Each year the Pantone color institute come out with a new color. Every color you see has a pantone number. Yesterday in an ad for tv they were using the new color. Personally find the colour dull, unless of course it’s for a baby. Personally find Pantene’s colour of the year to be a silly thing. But when it gives them promotion, like here, it’s obviously working. Most of us didn’t even know that Pantene came out with a new colour every year. Now we do. Caterina- Totally agree with about the dull color. Those are super calming colors. I love the name serenity! I’ve never heard of pantone matching system but it makes sense that we are being swayed as consumers with everything from verbal cues all the way down to color. Erica- I guess Pantone felt that it was time for a calming color. Every color has a Pantone number attached. I like the colors. They are calming. I’d be happy to paint a room with those colors but I don’t think I’d go for a rose quartz or serenity colored car. Ken- With all that is going on in the US calming is a good thing. Who knows with some of the funky colors for cars you never know. I must admit that while I’m all for the theme, I also prefer last year’s color. I think it’s always good to know these things but for business I have my brand colors and prefer to stick to those with slight variations. Thank you for sharing this with us! Marquita Herald recently posted…Do You See Obstacles as Problems or Opportunities? I too was unfamiliar with a color of the year. Trust me, I am no slave to any kind of fashion or trends, but do appreciate the effects that color has on your personality and motivation. William- I think most people are not familiar with the color of the year. Being in the promotional products business I have to keep on the changes. Color does have an effect on us all. I never knew there was a color of the year! I like deep, rich colors more than muted, pastel shades. So those are pretty, but wouldn’t find a home in my home. A little late in commenting, but while I think those are pleasant colors for clothing, perhaps, they don’t jump out at you if you’re promoting your company and its products. I know that everyone waits anxiously for the Pantone colors to come out every year. Who are the tastemakers behind Pantone that make these decisions? Jeannette- I just so a logo that used the new colors. Not my cup of tea but at least we have choices. If you don’t have something new each year people get bored. I always find it interesting to see what color is chosen and watch it become popular during the year. I liked last year’s marsala but these are so subdued that I’m underwhelmed. Beth- I did like the color Marsala but I am one who likes bold cold colors, so I guess Pantone wants to come up with colors that will appeal to all sectors. I’m very excited about the colors for this year. But then again, I’m a pastels fan. Hopefully we’ll see lots of people using them creatively in 2016!